A first-in-human Phase-I study has been going on since 2014. Participants were already heavily pre-treated, as they had already failed to respond to at least 2 TKIs. 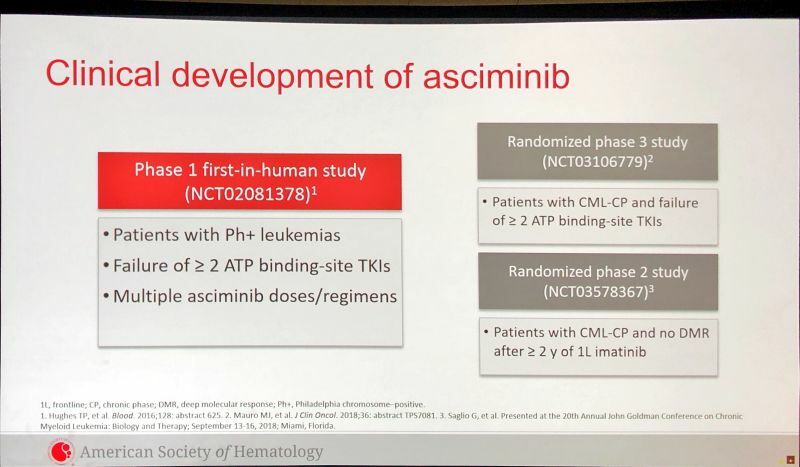 In this Phase I study, different combinations of Asciminib with Imatinib, Nilotinib or Dasatinib were tested in different doses (40-280mg) and regiments (once daily, twice daily) and patients with the T315I mutations received Asciminib monotherapy. 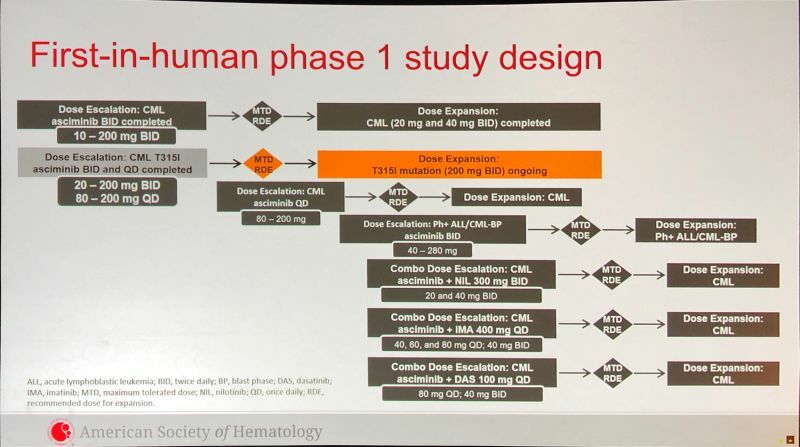 At this year's ASH, only the data of the 32 patients with T315I patients was presented. 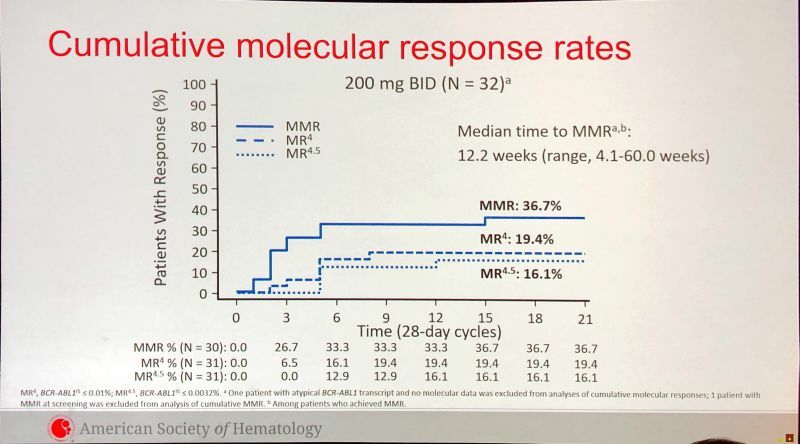 Of those, 36.7% achieved an MMR, 19.4% an MR4 and 16.1% an MR4.5 response on a 200mg dose of Asciminib, with a median time of 12 weeks to achieve major molecular response. One 1 of 32 patients had to discontinue treatment due to adverse events. 62.5% of patients reported drug-related adverse events, and only one fourth of those had severe side effects (grade 3-4: nausea, thrombocytopenia, increased lipase). No cardiovascular adverse events (QT prolongation) were observed. 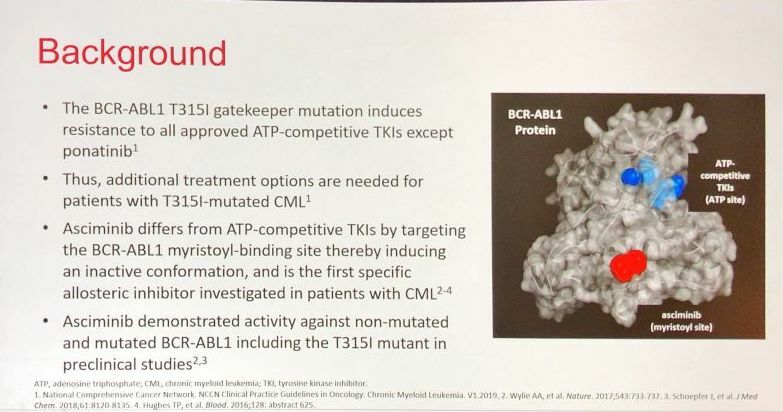 Overall, the authors conclude that Asciminib at 200mg shows promising efficacy and a favourable safety profile in CML patients with T315I mutation. Clinical benefit was observed in patients that had and hadn’t received Ponatinib prior to Asciminib.